The move to outsource the jobs of about 100 housekeeping employees at the Hyatt Regency Boston, Hyatt Regency Cambridge, and Hyatt Harborside at Logan International Airport is unusual in the hospitality industry, which counts on the housekeeping staff to help make sure hotel guests are comfortable. After hearing the news at meetings last month, employees cried and screamed, said Drupattie Jungra, 55, who had worked at the Cambridge Hyatt for more than 21 years and made $15.69 an hour, plus benefits. “Where am I going to go look for a job?’’ said Jungra, a widow who regularly sends money to her family in Guyana and whose four grown sons live with her. Like many hotels in the Boston area, the Hyatt has struggled this year, as a recession has caused people to cut down on their travel plans. Boston area hotels experienced a 21 percent drop in revenue per available room in June compared to the year before, according to PKF Hospitality Research, and 10 percent in July. Chicago-based Hyatt reported revenue fell 18 percent to $1.6 billion in the first half of this year. Other hotels have taken a different approach to riding out the recession. Earlier this year the Liberty Hotel ended its contract with the company that provided its security and night janitorial service and replaced them with hotel workers from other departments who might have otherwise been laid off. “We would not [outsource housekeepers] because we want to tightly control the guest experience here and the cleanliness,’’ said managing director Jim Treadway. Representatives from the Hilton and Marriott hotel chains said they have not outsourced their housekeepers and have no plans to do so. Paul Sacco, the president of the Massachusetts Lodging Association, said he isn’t aware of any other hotels that have outsourced their cleaning staffs but wasn’t surprised by the move. “In these economic times, it just calls for unusual initiatives that maybe we wouldn’t have looked at before,’’ he said. Janice Loux, the president of Unite Here Local 26, a union that represents local hotel workers, called the outsourcing a “race to the bottom.’’ The Hyatt housekeepers were not part of the union but reached out to Local 26, which is organizing a picket and rally in support of the housekeepers today at 5 p.m. at the downtown Hyatt. “Never ever in all my years have I seen a wholesale contracting out of an entire department,’’ she said. Loux said the new workers will make $8 an hour and receive no benefits, based on information from a Hospitality Staffing Solutions employee. Staffing firm president Rick Holliday sent out an e-mail stating his employees made competitive wages but didn’t answer further questions. The dismissed workers received two weeks of pay when they were let go, plus one week of pay for every year they worked at the Hyatt up to five or 10 years, depending on the hotel. According to the housekeepers, two Hyatt employees from each hotel were asked to continue working, though it was unclear if they would be employed by the Hyatt or by the staffing firm. Williams, a single mother of a 13-year-old with asthma, stocked up on medication before her insurance runs out at the end of the month. 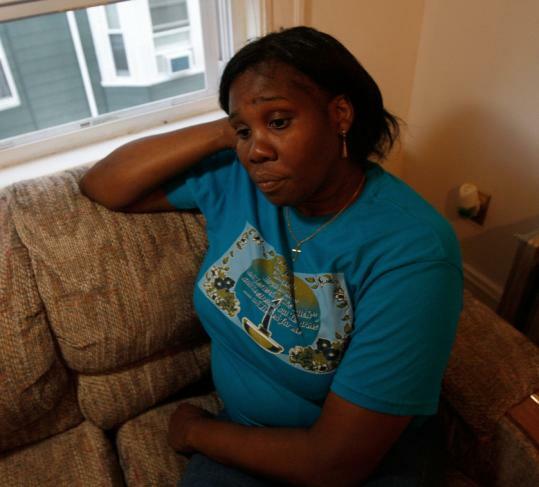 Last week, the former Hyatt Regency Boston housekeeper also had to cancel an airline ticket she’d bought the day before she was laid off to go see her father in Barbados. She hasn’t seen him since 2005, and isn’t sure when she’ll see him again.